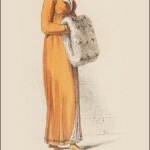 This is really not a dress, but a pelisse. Sometimes the dress underneath an outer garment is described, even when it is completed covered. 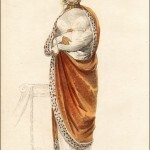 Here, no mention of the dress is made, only the description of the pelisse and accessories. 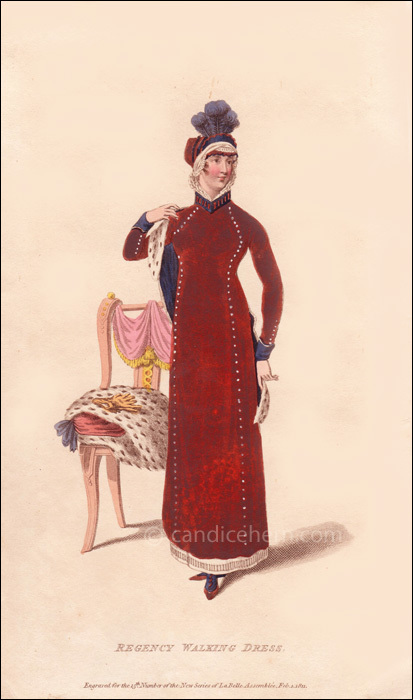 The designation of “Regency Walking Dress” refers to the Regency Act of 1811, giving the Prince of Wales power to act on the king’s behalf. The Act was approved in early January, though the Prince was not officially installed as Prince Regent until February. It is important to note here that although the print is dated February 1811, it was actually published in the January 1811 issue. (All La Belle Assemblée prints are dated for the following month.) 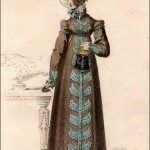 The description mentions how to adapt this ensemble for mourning. Princess Amelia, the king’s favorite daughter, had died on November 2. Per the Lord Chamberlain’s announcement, court mourning for her was to last until January 11. But that date had been extended an additional 3 weeks “in compliment to the deceased Queen of France.” (Marie Joséphine of Savoy, wife of the exiled Louis XVIII, had died two weeks after Princess Amelia.) So, this issue of the magazine would have been released before or near the originally scheduled end of court mourning.